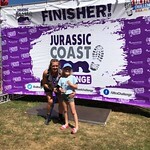 My name is Natalie and I completed the 100km Jurassic Coast Challenge for the Encephalitis Society at the end of July. I have written a blog about the challenge - and it was a challenge! - including my training and about how my daughter, Edie, fell ill with encephalitis. I want to say a HUGE thank you for the sponsorship I have had so far. I am in awe and would love to continue to raise as much as I can for a truly amazing cause that is really close to our hearts. The Encephalitis Society do such valuable work that changes lives (ours included). If you haven’t yet donated and can spare any cash no matter how small to help me make a difference then both me and Edie would be so grateful. Please visit my Virgin Giving page to make a donation. It’s really great to be able to sit today and write about the fact that I did it. Yes I did it – I managed 100k of some pretty challenging terrain and have raised more than I ever could have hoped to for an amazing amazing charity. We set out at 7:10am on Saturday morning while they played ‘highway to hell’ and finally walked through the finish line 30 hours later. At the time I commented on the inappropriate choice of music – how little did I know!!!!!! There were lots that didn’t finish as the heat combined with some serious hilly countryside took its toll. I have to say I had some real low points. At the 42k stop my muscles were literally shaking, I felt exhausted and really started to doubt that I had it in me. A quick look at my social media with all the good wishes and in particular the rising sponsorship total gave me a much needed boost, I shed a few tears, wiped them away and off we went. It was good to hit the official half way at Weymouth as this was actually a little way over halfway at 57k so it felt good to get there. Even though it was after 11pm we had loved ones there waiting for us to arrive as well as a proper meal and a leg massage. We spent a little while at this stop refuelling and dealing with our now pretty impressive blister collection. A change in socks, boots back on and the night section of the trek commenced. I was really worried about this section as I knew the beautiful scenery during the day would be a good distraction, however, darkness, quiet and time to really focus on why I was doing this and what it meant to me was a really positive thing and the night passed and gave way to the most beautiful sunrise. By 8am we reached the Abbotsbury rest stop for breakfast. By this point our legs and feet were broken but we were at 82k and there was absolutely no way we were going to give up. The next section had 3k of the very pebbly Cheshil Beach to conquer as well as a couple of climbs towards the very end. I knew from this point it was a case of just putting one foot in front of the other and counting down the kilometres. That last 18k was tough and when I say tough I mean really tough but once we turned that corner and walked across that finishing line it was totally and utterly worth it. Edie presented me with my medal which was really special and hugs from both my girls and husband and a couple of glasses of champagne were everything I could have wished for at that point. I have to say am pretty sore still and expect it will probably take me this week to return to walking in a more normal fashion! I am determined to keep the walking up (though maybe not quite that far) as I really have felt the benefits both mentally and physically and I would encourage any of you to think about doing something like this. It feels so good to be able to say thank you to the Encephalitis Society properly and I know the money I have raised will make a real difference. It also really helped to have some time to work through some of the emotions I probably buried deep inside when Edie was so poorly as I had the time to look around and think about and appreciate what I have and how lucky I am / we are. Now to look forward to our family holiday in France and to getting rid of my blisters! So its less than two weeks to go and the nerves are really starting to set in. A great couple of weeks training and continuing to fit as much walking into my every day as I can. It was great to win our workplace 10k a day challenge – as you would expect given what I am about to take on I more than covered the 10 000 steps and actually did over 1 million in the allotted time! This weekend was a lovely birthday trip to Silverstone for the Grand Prix. I nearly typed unfortunately but actually a more appropriate word is that fortunately training continued across the three days. I covered more than 14 miles around the circuit on both Friday and Saturday and cut that down to a more leisurely 7 miles on the Sunday. What this meant was that I got to see so much more of the circuit (several times! ), take in the atmosphere and meet some really lovely and inspiring people along the way. I was lucky enough to get chatting to an ex-service man who had lost both of his legs in Afghanistan – his courage, positivity and absolute enthusiasm for life was infectious and made me realise that, compared to so many people facing so many things, this 100k is to be enjoyed and appreciated and not to be worried about or feared. I am lucky that I can train and I am lucky that I can give this a go and give it a go I will! As always a few pictures and the link to my page below. The Encephalitis Society are truly fabulous – please donate if you can. A good week with 140,911 steps in the last seven days! I am walking literally everywhere and actually most of the time really enjoying it. What I have really noticed this week is how much the walking particularly after a long day at work gives me some headspace to mull things over and importantly some time to really de-stress. This thinking time for me has always been lacking as I balance a busy full time job with the needs of my family and it’s something I am determined to hang on to post the Jurassic 100k. In the last couple of weeks,my work colleagues have been amazing at keeping me motivated. If it wasn’t for the weekly workweek challenges set by Simon, Margaret, Laura and Clare I’d probably be far more tempted by the sofa and a glass of wine than my walking boots!!!! The only other thing to report this week is our first attempt at some night walking. 28km testing out our head torches and it went well. Sounds obvious but it’s such a different experience walking in darkness - am not the bravest so given I’ll have a full night of this to do soon am glad have given it a go!! I am feeling like the training has really stepped up a level in the last week. With over 170,000 steps in the bag in seven days, I am certainly making use of my feet and my newish/now well worn in walking boots! Well I said last time I’d give you the highs and the lows so here they are. Funnily the high was also the low which has got me thinking about all sorts of other areas of my life that this learning might apply to!!!! The best bit of my week by a long way has to be walking 46.6km in one go. I have never attempted to walk/run that far (of course I realise very soon I will be attempting to go much further). Even back in my days of being a keen horse rider that distance would have felt a long way. So, am really really proud I made it with a minimal amount of complaining (am sure my fellow trekkers will confirm that!). Now to the low, it was tough. When I say it was tough it was really tough and bits of my feet I never knew could hurt do hurt quite a lot! I’ve also acquired an interesting and not necessarily attractive rash around both ankles so need to consult google on sock choice quickly! I think for the next few days trainers or slippers will be my choice of footwear which will be interesting at work! On balance a good week overall and I’ve proved I can do almost half the distance. I am determined to do a good job of this and if anyone can spare any money to support such a great charity then it’ll really help to keep me going! So I guess a good place to start is to say a little bit about me and why I decided earlier this year to trek 100k along the Jurassic coast proudly wearing my Encephalitis Society vest and being in the privileged position of being a part of Team Encephalitis. Well, I’m a 41 year-old working mum of two from Nottingham and four years ago I had no idea what encephalitis was or what that meant or would mean for my family. My then four year-old bright and beautiful little girl Edie had come home from school feeling unwell. Calpol and early to bed seemed an appropriate course of action given this was nothing out of the ordinary. However, within a few hours, things had taken a significant turn for the worse. Later that evening, assuming that she would be fast asleep, I discovered Edie in her bed having what appeared to be some kind of fit and completely unresponsive. We of course dashed to our local A&E department where the NHS staff were exceptional right from the outset. We were lucky (I now realise) that the neurology team became immediately involved and a Lumbar Puncture and MRI scan revealed Edie was fighting encephalitis. The days that followed were quite honestly terrifying. I would regularly ask doctors for assurance that she would be okay and the only thing they were able to tell me was that she was a very poorly little girl. The many hours I spent sat beside her bed watching her completely still, contemplating how life might change was heart breaking. Of course we all take our health and that of our loved ones for granted and never consider that we might end up facing an uncertain future or the help and support we might appreciate if we do. The care Edie received over the weeks and months to follow continued to be outstanding and right from the first time the word encephalitis was uttered, we as a family benefited hugely from the information and support provided by the Encephalitis Society. It is something we simply could not have managed without. I use the word "lucky" a lot and that’s absolutely right as we are extremely lucky that, although it's been a long journey, Edie has recovered well. I know that many are not this fortunate and that is exactly how I found myself earlier this year looking for a challenge suitably difficult enough that I could encourage friends and family to donate their hard-earned cash to something that means so much to us. So.... here I am! Signed up to 100k. No stopping and no sleeping along a beautiful coastline. I hope I am up to the job! It's only walking I told myself. You just need to put one foot in front of the other I told myself. Hmmmmm – having now done some longer walks (20 miles my personal best) I am starting to realise that I need to take this seriously...! I’ll be writing about my training as I go along. The highs (hopefully) the lows (probably) and all that is in between. One thing that is certain is that I’ll be giving this my absolute best and doing all that I can to push my fundraising total as far as I am able. *If you would like to take part in a challenge event or community fundraising, please get in touch with our fundraising team by email or calling +44(0)1653 692583.